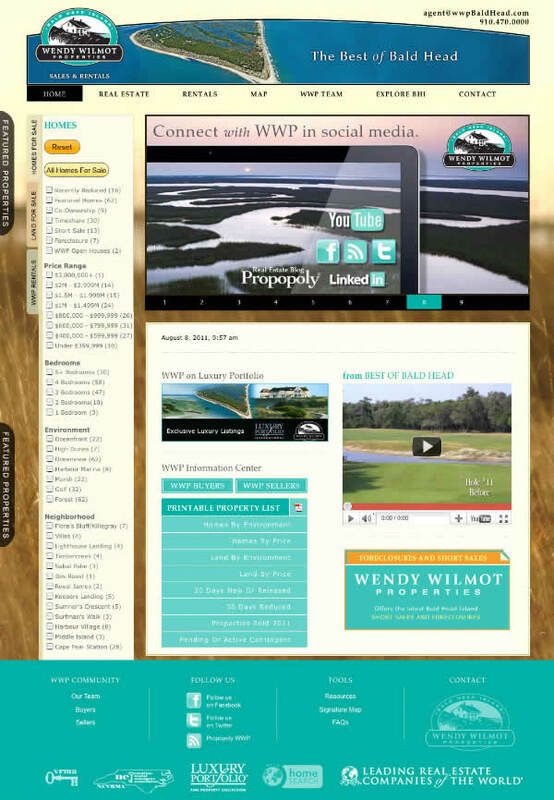 InterCoastal Net Designs recently launched the updated and improved site of Wendy Wilmot Properties, a vacation rental and real estate company located on Bald Head Island. ICND developed and added a Custom Booking Engine (Escapia) with a customized search filtering system (see left panel of their homepage) to their website. This is very different than our usual quick search boxes and offers the user many more options when searching. A custom real estate MLS Integration with customized search filtering system was also developed for the site. Wendy Wilmot Properties offers a complete list of all Bald Head Island vacation rentals and real estate for sale. They are the island specialists! From the most notable builders and architects to the premium locations scattered throughout this Island, Wendy Wilmot Properties showcases the finest homes and lots available. Whether you are more at home with the ocean as your playground or you prefer to settle in the protective arms of the maritime forest, Wendy Wilmot Properties offers homes and home sites that cover nearly every environment, style and price range that Bald Head Island offers. The uncommon level of service and valuable insight of their brokers are the direct result of their passions and experience as resident REALTORS® of Bald Head Island. With Wendy Wilmot Properties you’re doing more than hiring a vendor — you’re building a long-term relationship with solid foundations. Their experienced agents are islanders themselves, who enjoy exploring Bald Head Island with new and existing clients every day. Beginning with your individual interests and goals, their skilled real estate professionals will develop a customized package of information based on your preferences in home styles, living environments, pricing and amenities. Also included will be a wealth of general information with a candid and comprehensive perspective on the Island, developed exclusively by Wendy Wilmot Properties. The service and attention to your needs is paramount to these professionals. With only a few clicks you can preview the exclusive luxury listings on their web site, including hi-resolution photos and extensive details about each property. If you see something that strikes your eye, simply contact any one of their trusted Realtors for an immediate private showing.